"Opportunities and Challenges within Order Management in Manufacturing"
The Order Management Strategies for Efficiency and Growth provides benchmarks and associated recommendations to small and medium-sized businesses on how to optimize operations to help grow their business. This informative whitepaper is based on a survey of more than 200 manufacturing companies in the U.S., wholesale distribution and retail sectors, discusses the opportunities and challenges around order management process. How does your order management performance stack up? 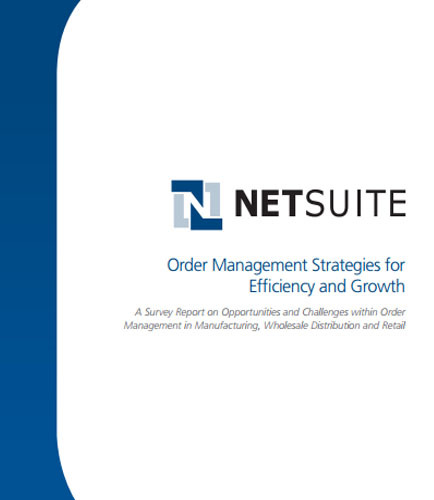 Download this whitepaper to find out why improving order management is the top customer-focused initiative and get practical recommendations on proven strategies to drive satisfaction and sales. Benchmark your order and fulfillment efficiency against your peers! !